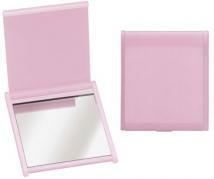 These slim, lightweight little Mirrors are sure to be a great hit! It's slim cover, when folded back, doubles as an easel-stand. 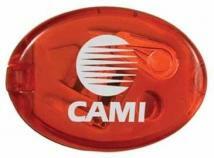 Your custom imprint featured on any of several great, electric colors. Individually poly bagged. 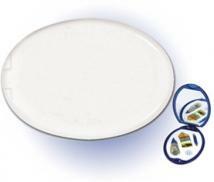 Size: 2 3/8" W x 2 5/8" H. Max Imprint Area: 1 7/8" Diameter. WT_100: 5 LBS. Paper-Proof: $10. (Required on all labels). Rectangular compact mirror. Size : 3 3/8" x 2 1/8"
Reinforce your message and your company identity with this useful sewing kit, the great price won't break the bank, Perfect for travel. 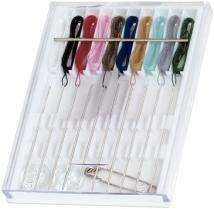 Includes: 2 buttons, needle, safety pin, thread card (9 colors). Size : 1-3/4"W X 2-7/8"H X 3/16"D. Imprint Location: Outside Front Cover (Standard): 1-1/2"w x 2"h, 4 color(s) max |Outside Back Cover (Optional): 1-1/2"w x 2"h, 4 color(s) max |Outside Front Cover and Outside Back Cover (Optional): 1-1/2"w x 2"h each location, 4 color(s) max Packaging: Bulk Pack Of: 1050 Weight: 10 lbs. 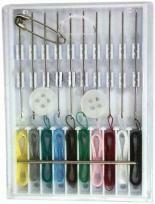 10 pre-threaded needles with multiple colors of thread 2 buttons and a safety pin. Decorating Dimensions: 1-3/4"W x 2-1/4"H Shipping Information Packed: 250 Per Box Actual Weight: 14 lbs. Dim Weight: 14 lbs. Box Size: 15 x 11 x 10. 10 Pre-threaded needles. Product Dimensions: 3-1/8" H x 2-3/8" W. Imprint Area: 2-1/8" H x 1-5/8" W. Additional Color Running Charge: $0.12 each per color. Packaging: Individually poly bagged. Shipping Weight: Approx. 15 lbs. per 250. 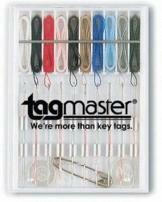 10 pre-threaded fine point needles, 10 different colored threads attached to needles, 1 safety pin & 2 buttons included. Size : W 2 1/2" x H 3"
Pre-Threaded Sewing Kit. Ten colors pre-threaded to long, steel fine-point needles Safety pin and two buttons included Size : 2"w x 3"h Imprint Area : 1-7/8"w x 2"h Optional Packaging: Polybag Shipping info: 500 pieces per carton, 26.00 lbs per carton, carton size 10.00" x 12.00" x 10.00"
Contains (10) pre-threaded needles with (10) different thread colors. Includes safety pin and two buttons. 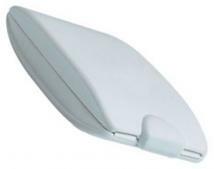 Size : 3" h x 2" w. Standard Imprint Area : 1 1/2" h x 2" w. Packaging : Bulk. Shipping Weight : 100 / 6 lbs. Take-along Travel Sewing Kit. Size : 3 3/16" W x 2 3/8" H x 3/8" D Imprint: 2 1/2" W x 1 1/2" H Weight: 7 1/2 lbs / 100 Pcs Standard Packaging: Bulk. A stitch in time made easy. Each kit contains 10 needles already pre-threaded, plus two, spare buttons. The pre-threaded needles have a generous supply of thread, each in a different color. The easy-to carry case features a new, frosted window, that hinders scratching and provides brighter, more permanent imprints. Note: The imprint is screened on the clear cover unless otherwise instructed. Dark-color imprints recommended. Material: Impact styrene Made In: China Size: 2 1/4" x 3" Imprint Area: 1 3/4" x 1 3/4" Box Size: 13 x 11 x 11 Shipping: 28 lbs/550 pcs. 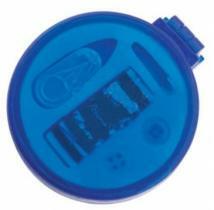 Transparent colored plastic sewing kit. Finish/Material: Plastic Dimensions: 3" W x 17/8" H x 3/8" D Imprint Area: 1" W x 7/8" H Shipping Information: Carton Size: Box Length: 11.10 Box Width: 9.90 Box Height: 17.00 Standard Packaging: Polybag Carton Weight: 33 lbs. / 500 pcs. 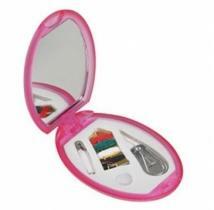 Mirror included Multiple thread colors Button, Needle, Threader & Safety Pin included 6 vibrant colors Ideal for traveling. Size: 3" x 2-1/8" Imprint Area: 2-1/4" W x 1-1/2" H Packaging: Bulk packed. Weight: 34 lbs. per 500 pcs. Compact Mirror w/6 Component Sewing Kit. Please specify ITEM # and color: Trans Red 1603-TR,Trans Blue 1603-TV. Size: 3" x 2 1/8" Imprint: 1" x 1 3/4" Packaging: Bulk. Weight: 4 lbs/100 pcs. 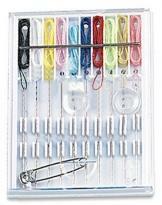 Includes 10 different pre-threaded needles with assorted color thread, 1 safety pin and 2 clear buttons. Actual Size: 3"h x 2-1/4"w Imprint Area: 1-1/2"h x 1-1/2"w Packaging: Bulk. Individually polybagged. Shipping Weight: 20lbs per 250pcs. Being prepared for wardrobe malfunctions is "sew easy" with this useful sewing kit. 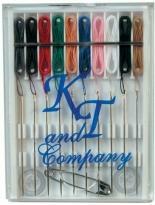 Kit includes 10 pre-threaded strands, 2 buttons and 2 safety pins. Ideal for an advertiser doing business along main street. Dimensions: 2 3/8" H x 3 1/8" W x 3/8" D Imprint Area: Front or Back: 1 3/4" H x 2 1/2" W Packaging: Individually poly-bagged Shipping Info: Box Dimensions: 16" L x 12" W x 12" H Shipping Weight: 6.21 lbs / 100 pcs 500 pcs / box. Compact Sewing Kit With Mirror. 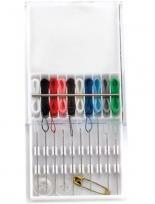 Includes : 2 Buttons Safety Pin Needle Assorted Thread Colors Threader. Size : 2 7/16" Dia. Travel Sewing Kit. Includes : 10 Pre-threaded Needles 2 Buttons Safety Pin. Size : 3" x 2 1/4"
Silver Compact Mirror. 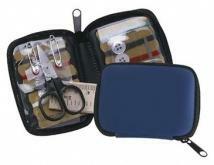 Size : Folded - 3 1/4" x 2 1/4"
Attaches to your luggage Hidden compartment for sewing kit Includes I.D. Card. 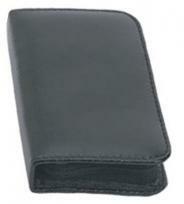 Size : 2 1/2" h x 3 1/4" w. Standard Imprint Area : Standard on back: 1 1/2" h x 2" w Optional on front: 1" h x 2" w. Packaging : Bulk. Shipping Weight : 100 / 8 lbs. Emergency Sewing Kit. 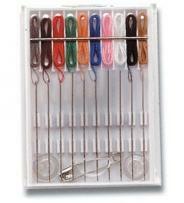 Includes : 2 Buttons 2 Safety Pins Scissors Needle Pin Assorted Thread Colors Threader. 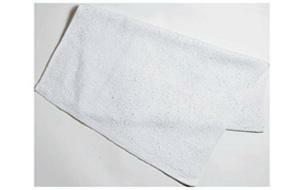 Size : 3 1/2" x 2 1/8"
A popular item for frequent travelers! 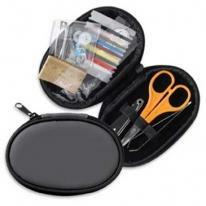 Translucent oval sewing kit with mirror. Individually poly bagged. Size: 3" W x 2 1/8" H x 3/8" D. Max Imprint Area: 2 1/4" W x 1 5/8" H. WT_100: 10 LBS. Paper-Proof: $10. (Required on all labels). Double swivel design. 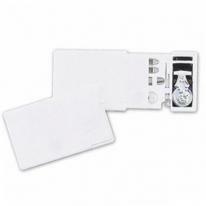 Slide open outer cover to access ID tag and inner cover to access mini emergency sewing kit. 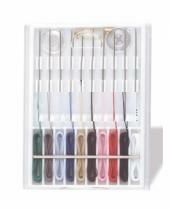 Includes 2 sewing needles, 6 colors of thread, safety pin, small white button and needle threader. Adjustable rubberized strap for easy attachment to bags. Decorating Dimensions: Front : 2"W x 1"H Back : 2"W x 1-1/4"H. Shipping Information Packed: 200 Per Box Actual Weight: 15 lbs. Dim Weight: 15 lbs. Box Size: 15 x 11 x 14. 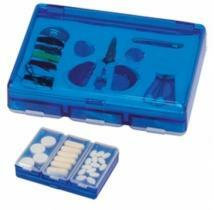 Repairing clothing or other items is simple with this handy kit. It comes with 10 colors of pre-threaded needles, two buttons, and a safety pin. This is an excellent item for the elderly. 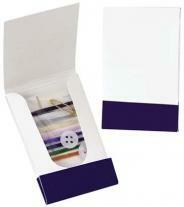 Ideal for hotels and resorts Includes: 2 buttons, 10 needles pre-threaded with assorted thread colors, safety pin. Size : 2-15/16"W X 2-1/4"H X 1/4"D. Imprint Locaton: Clear Cover (Standard): 2"w x 1-3/4"h, 2 color(s) max. Packaging: Polybagged Pack Of: 250 Weight: 14 lbs. 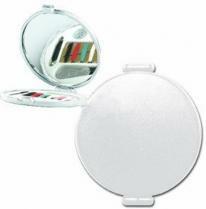 This stylish pocket mirror comes in fun frosty colors, and is a perfect gift for anyone who travels or is on the go. Perfect for trade show giveaways. Size : 2-3/16"w x 2-9/16"h x 3/16"d. Imprint Locaton: Front (Standard): 1-3/4"w x 2"h, 3color(s) max. Packaging: Polybagged Pack Of: 350 Weight: 23 lbs. Compact design. 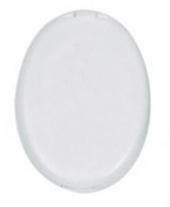 Product Dimensions: 3" H x 2-1/8" W oval. Imprint Area: 1-1/8" H x 1-5/8" W. Additional Color/Side Running Charge: $0.12 each per color per side. Packaging: Individually poly bagged. Shipping Weight: Approx. 17 lbs. per 250. On the road or around the home, this handsomely constructed, attractive sewing kit, will carry your name or message in fine style. Sliding plastic lid. Individually poly bagged. Size: 2 1/4" W x 3 3/8" H Max Imprint Area: 1 1/2" W x 2" H WT_100: 6 LBS. Paper-Proof: $10. (Required on all labels). 2 in 1 handy travel item. Travel size lint brush. Removable sewing kit inside. 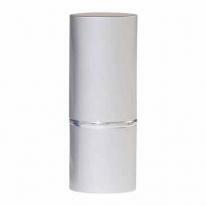 Size: 1-1/2"h x 4"w. Imprint Area: 3/4"h x 1-1/2"w Packaging: Bulk. Individually polybagged. Shipping Weight: 13 Shipping Quantity: 200. Includes sewing kit Great lint brush. Product Dimensions: 1-1/2 "H x 3-3/4" W x 5/8" D. Imprint Area: 1" H x 2 1/2" W. Additional Color Running Charge: $0.12 each per color. Packaging: Individually poly bagged. Shipping Weight: Approx. 11 lbs. per 150. 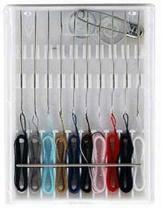 Mirror included Multiple thread colors Button, Needle, Threader & Safety Pin included Ideal for traveling. Imprint Area: 2-3/8" W x 1-5/8" H Packaging: Bulk packed. Weight: 34 lbs. per 500 pcs. 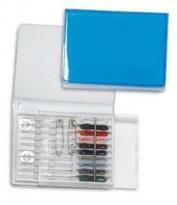 6 piece sewing kit 3 pill compartments. Product Dimensions: 2 1/2"H x 3 1/2"W x 7/8"D Imprint Area: 1 1/2"H x 2 1/2"W Additional Color Running Charge : $.12 each per color Packaging: Individually poly bagged Shipping Weight: Approx. 15 lbs. per carton of 150. 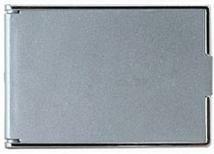 High Impact Plastic With Shatter Resistant, High Quality Mirror. 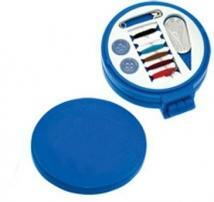 Twist Off Lid To Reveal Sewing Kit - Contains 6 Colors Of Thread, Needle, Needle Threader, 2 Buttons And A Safety Pin. Hair Brush. Note: Cost shown is for Colors only. Other color available, please see (Item Number: 7115Silver). 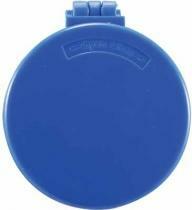 Approximate Size: 2 1/4" Diameter Imprint Area: 1 5/8" W x 1 3/8" H Packaging: Cello Bag, 250 per carton @ 31 lbs. Compact design Three function design. 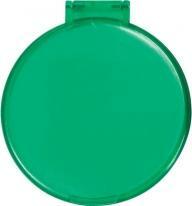 Product Dimensions: 2-1/2" diameter. Imprint Area: 1-1/2" diameter. Additional Color Running Charge: $0.12 each per color. Packaging: Individually poly bagged. Shipping Weight: Approx. 21 lbs. per 150. This handy kit combines three useful items into one. Mirror. Hairbrush. Sewing kit. Individually poly bagged. 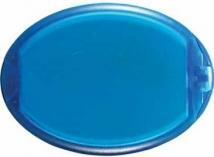 Size: 2 1/2" W x 2 7/8" H x 1 1/8" D. Max Imprint Area: 1 1/ 2" Diameter. WT_100: 14 LBS. Paper-Proof: $10. (Required on all labels). Be prepared for anything while traveling. Features sewing kit, 3 latex-free vinyl bandages, 2" x 3" adhesive pad, 1 antiseptic towelette, 1 antacid packet and 200 mg ibuprofen packet. Great trade show item for any type of advertiser. Dimensions: 2 7/8" H x 4 1/2" W x 1/2" D Imprint Area: Front or Back: 1 1/2" H x 3" W Packaging: Individually poly-bagged Shipping Info: Box Dimensions: 18" L x 16" W x 12" H Shipping Weight: 6.00 lbs / 100 pcs 600 pcs / box. 2-in-1 Combination Kit, Nail care and sewing kit in full zippered pouch, Travel sewing kit & nail care kit in one! Needle threader, 25" L paper measuring tape and clear plastic pouch with white shirt buttons, sewing needles, metal smaps and safety pin, Nail care kit includes scissors, tweezers and nail clipper with file. Size : 4 1/4" W x 2 3/4" H x 1" D. Imprint: 2 1/2" W x 1 1/2" H. Weight: 14 1/2 lbs / 100 Pcs. Standard Packaging: Bulk. This wallet-style vinyl case holds a variety of personal care and sewing products, and can be used after the original contents are gone! 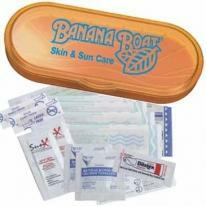 Great first aid kit for travel or a convention gift|Latex-free bandages. 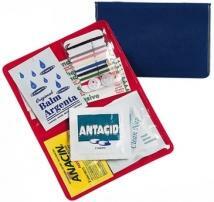 Includes: 11 pieces: Anacin(R) packet, antacid packet, 2 bandages, 2 buttons, clean nap, needle, Original Balm Argenta lotion packet, safety pin, thread card. Size : 3-15/16"w x 2-1/2"h x 1/2"d. Imprint Locaton: Front (Standard): 3"w x 2"h, 4 color(s) max |Back (Optional): 3"w x 2"h, 4 color(s) max. Packaging: Bulk Pack Of: 250 Weight: 11 lbs. 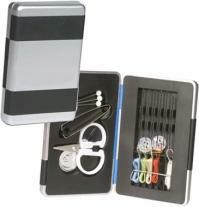 Coleman Travel Sewing Kit is great for home, purse, backpack, or car. 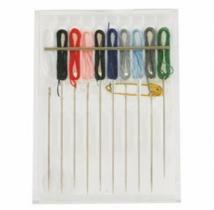 This kit includes mini sized polyester thread in multiple colors, scissors, thimble, threader, 5 needles, 8 buttons, 2 straight pins, 5 safety pins and 2 snaps. 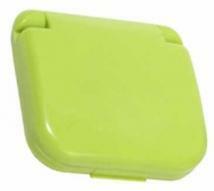 Product Dimensions: 2-1/4"x3-1/4"x1" Imprint Size: 1-7/8"W x 2-7/8"H Case Pack Qty: 6 Case Pack Shipping Weight (lbs. ): 1. A: First Aid Contents: 4 latex-free vinyl bandages, 4 Swabplus swabs, 2 snip bandages, 2"x3" adhesive pad, 1 first aid cream packet, 1 antacid packet, 200 mg ibuprofen packet, and instructions. B:Trip Contents: 4 latex-free vinyl bandages, 2 antibacterial gel packets, 1 sewing kit, 1 Blistex packet, 1 antacid packet, and 200 mg ibuprofen packet C: Outdoor Contents: 4 latex-free vinyl bandages, 2 snip bandages, 2" x 3" adhesive pad, 2 antiseptic wipes, 2 sunscreen packets, 2 insect bite relief swabs, 1 Blistex packet and instructions. D: Golf Contents: 3 latex-free vinyl bandages, 2" x 3" adhesive pad, 1 antiseptic wipe, 2 sunscreen packets, 2 insect bite relief swabs, 3 tees, 2 ball markers and instructions. Dimensions: 2 9/16" H x 6 1/2" W x 1" D Imprint Area: 1 1/4" H x 4" W Packaging: Individually Polybagged. Shipping Info: Box Dimensions: 21" L x 19" W x 18" H Shipping Weight: 14.32 lbs / 100 pcs 200 pcs / box. A: First Aid Contents: 4 latex-free vinyl bandages, 4 Swabplus swabs, 2 snip bandages, 2"x3" adhesive pad, 1 first aid cream packet, 1 antacid packet, 200 mg ibuprofen packet, and instructions. B: Trip Contents: 4 latex-free vinyl bandages, 2 antibacterial gel packets, 1 sewing kit, 1 Blistex packet, 1 antacid packet, and 200 mg ibuprofen packet C: Outdoor Contents: 4 latex-free vinyl bandages, 2 snip bandages, 2" x 3" adhesive pad, 2 antiseptic wipes, 2 sunscreen packets, 2 insect bite relief swabs, 1 Blistex packet and instructions. 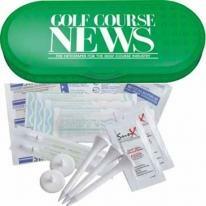 D: Golf Contents: 3 latex-free vinyl bandages, 2" x 3" adhesive pad, 1 antiseptic wipe, 2 sunscreen packets, 2 insect bite relief swabs, 3 tees, 2 ball markers and instructions. Dimensions: 2 9/16" H x 6 1/2" W x 1" D Imprint Area: 1 1/4" H x 4" W Packaging: Individually Polybagged Shipping Info: Box Dimensions: 21" L x 19" W x 18" H Shipping Weight: 13.64 lbs / 100 pcs 200 pcs / box. 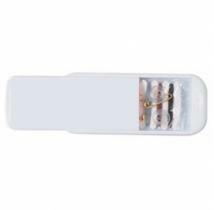 Kit Includes: Scissors, Nail Clipper, Nail File, Tweezers, Nail Tip Groomer And Cuticle Pusher. Note: Other decorating methods available, please call. Approximate Size: 1 3/4" W x 4 1/2" H x 1 1/4" D Imprint Area: 3/4" W x 1 3/4" H Packaging: Gift Box, 100 per carton @ 18 lbs. 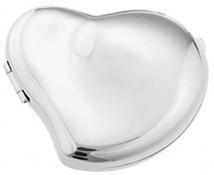 Curvy heart shaped compact mirror in a polished silver finish. Size: 2 3/8L" x 2 1/8W" x 5/16H" Imprint: 1 1/4W" x 1H". Qty/Box: 120 ShipWeight: 24lbs. Kit Includes: Hair Brush, Mirror, Sisal, Massager, Nail/Toe Brush With Pumice Stone And Bath Slippers. Bag: Clear Plastic with Natural Trim and Drawstring. Approximate Bag size: 5 3/4" W x 14" H Imprint Area: 3" W x 2" H Packaging: 20 per carton @ 18 lbs.